Congratulations to our Client Abiie for their feature on BuzzFeed! 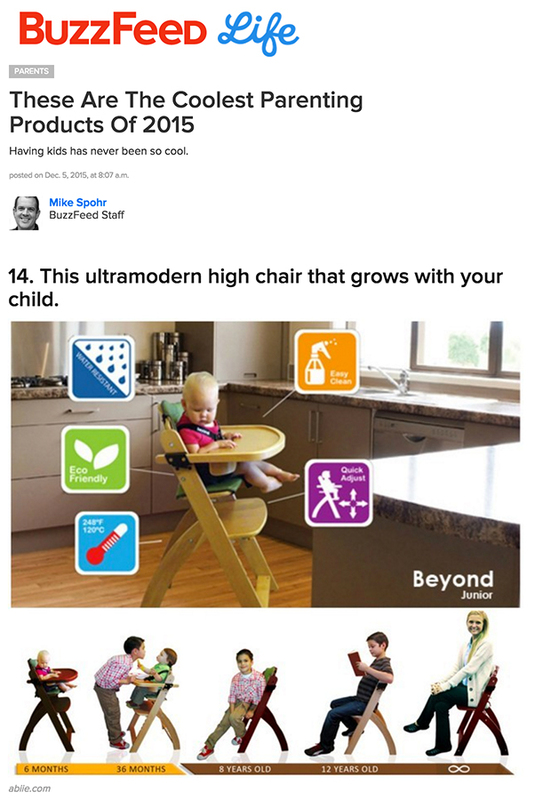 Beyond Junior Y by Abiie is an ultra-modern wooden high chair designed to grow with your child from infancy to adulthood. Its revolutionary EZ-Seat technology not only makes the sitting area easy for cleaning, it also enables quick adjustment of the seat & footrest to provide a comfortable chair for your child within seconds. The sleek and contemporary high chair, made from top quality European cultivated beech wood, is both sturdy and eco-friendly, a perfect choice for your family that will last for years to come. Beyond Junior Y chair meets and complies with ASTM F404 & HR 4040 standards and contains No harmful substances, such as BPA, Phthalate, PVC. Check them out at abiie.com!